The floweredy curtains and bed spread were moved to another room. The carpet was ripped up, floors waxed, cushiony colored foam mat in place. Paint cans, brushes, ladders, and blue tape were put to good use--walls done. Since we do not know the age and size of our son, we debated about the type of bed to purchase. Toddler or twin? Ughhh. Thanks to all who shared their insight about this. Finally, my dad found one in Virginia, brought it home, and put it together. The tent on top of the bed can be removed at any time. We thought it would be fun. Jeff painted several pictures that are "one of a kind wonderful". 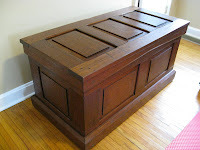 A chest that my great grandfather built was refinished by my dad to serve as a toy chest and seat--cool dude! I walk into our son's room several times a day. Praying that he may know that he has a mommy and daddy that love him and can't wait to hug him. Praying that I will be a godly mother who's love for Jesus is evident in my life. Looking forward to this little room being filled with a big roar of laughter and fun times. In case you are wondering, that is a stuffed animal--a soft doggy to be exact. He has been keeping the bed warm.